In a wander around the internet I came across Irish government statistics on house prices. When did the hallucination begin? And hubris was so un-Irish. Not anymore. Who did Irish taxpayer’s bail out? 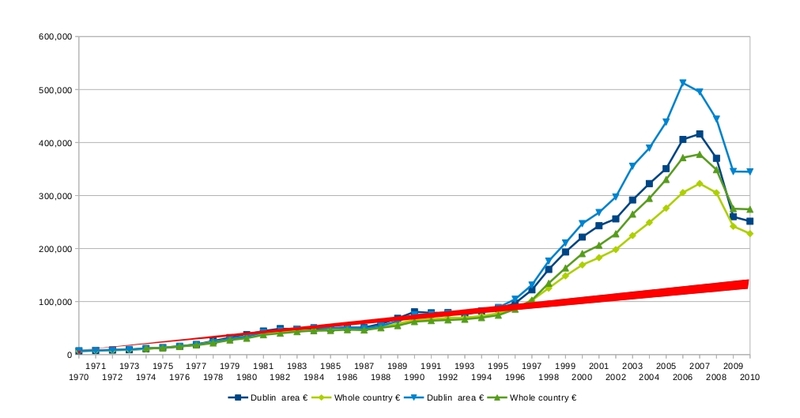 An unsurprising analysis of teh commitment teh Irish government took on in bailing out unguaranteed bondholders. Read Who are the bond holders we are bailing out? by David Malone author of Debt Generation. The list is good to have, though it is the story that makes you cringe with disgust at the greed and carelessness of rich and powerful people. Are we saying goodbye to privacy in EU? and the world? Norway, a member state of the EU, makes most tax information available to the public for free, online and with analysis tools. You can compare incomes and wealth of celebrities, friends, yourself. You can see where people live. There are positive aspects to this open approach to disclosure – it supports a more egalitarian economy. But it might be uncomfortable and while human culture suffers from primitive instincts of greed and fear, might even facilitate abuse and crime. But this open approach to economics is likely to spread. Certainly in the EU, which is becoming increasingly autocratic/bureaucratic with milestones like Lisbon. And then other western countries and the rest of the world. It will certainly catalyse an equalisation of wealth as those who garner grossly unreasonable wealth will be pressured to hold back and give back. People will want to demonstrate that they are deserving of extraordinary gains. That raises the question of whether people have earned their income – did they work long hours?, develop new technology?, house the homeless?, feed the poor?, put their capital at risk? invest for good or simply gain?, belong to an oligarchy of elite? That kind of information is missing. Personally, however, I like my privacy. And I’m quite happy to honour other people’s privacy. I suppose that it wouldn’t be so bad if it was simply disclosure of public record, which tax record disclosure might be said to be, but when there is someone staring in through your window you become like a prisoner in your own home. Amnesty International released Freedom Limited, a report detailing declining freedom of speech in Putin’s Russia. Unsurprising, but sad news. A backlash is inevitable, but probably later rather than sooner. Intelligent systems naturally tend to open systems; Russia’s wealth is fuelling its intellectual capacities which will demand openness in governance. The European Environment Agency released its fourth assessment report on the environmental situation in 53 European countries, highlighting significant air pollution, biodiversity loss and poor water quality across the region. The irony of the report is that a principal cause of these problems is growing consumption and the demand for transport neither of which people seem willing to reduce. In general, the report points to the environmental impact of agriculture and energy as well as consumption, transport and other economic activities. Among the most alarming findings in the report is the observation that air pollution likely reduces the life expectancy of Western and Central Europeans by almost one year. Heightened economic activity in the EU’s wider neighbourhood, including Central Asia and the Caucasus region, has led to a 10% increase in air pollution since 2000. Access to safe drinking water is a problem in many parts of the region, especially in rural areas. More than 100 million people in the pan-European region still do not have access to safe drinking water and adequate sanitation. Climate change is also increasing the frequency and severity of droughts. 700 European species are currently under threat”, according to the EEA, and the general biodiversity trend on agricultural land is negative despite agricultural policies being increasingly geared towards biodiversity conservation. There is a wide-ranging set of problems faced by Europe’s oceans, inland waters and coastal environments, including over-fishing, eutrophication (particularly from agricultural run-offs), pollution, oil spills and regular discharges from vessels, population densities and ecosystem collapses. We may conclude that the report makes clear that we are good at talking about improving environment, but fail to actually take much action on a personal, business or institutional level. The European Central Bank left interest rates unchanged at 4% on 7 September, but it is not clear that they will not be increased to 4.25% soon. The ECB is reacting to the increase in perceived risk in financial markets, catalysed by the sub-prime meltdown. At the same time as the hold on rates increase, the ECB provided another €42 billion to the banking system, whose liquidity has dried up as banks continue to be reluctant to lend to each other, without knowing the scale of losses in the lending markets. Unfortunately, it will be some months before the scale and scope of the liquidity crisis might be known, and this will make interest rate decisions more difficult. However, I think it unlikely that they will be brought down this year.